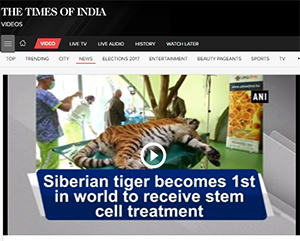 Siberian tiger becomes 1st in world to receive stem cell treatment. A Siberian tiger in a Hungarian zoo was given stem cell joint treatment to heal his hip without the need of giving painkillers. The tiger named Igor, is the first to receive Lipogems stem-cell treatment. Extracts from his own fatty tissue, which contains regenerative stem cells, were injected back into his ailing joints. His surgeon says the treatment should vastly improve the Hungarian zoo. Április 19-én jelent meg videó az eseményről a The Times of India oldalán.